Before I got my book deal to write contemporary romance with Harper Collins, HQ DigitalUK, I had some cosy mystery short stories published and I’m currently working on a series of cosy mystery novels (I’ll keep you updated on those when I have anything exciting to share!) So I thought I’d share some tips I’ve learned about writing cosy mysteries. Here are my top 5! There’s a big difference between writing a short story and writing a novel. In a novel you have a long time to get from A to B, but in a short story, every word counts. This means it’s important to have a cast of characters that isn’t too big but still allows you to have red herrings and suspects. When you write a novel, you can have lots more characters but you still need to plan and write tightly so you don’t end up confusing yourself or your reader! The reader should be able to follow the sleuth unravelling the mystery without wondering what the heck is going on! As a general rule cosies have amateur sleuths as the main character. Someone who won’t have access to police records or forensics. One of my favourite sleuth’s is Miss Marple, written by Agatha Christie, because it’s her understanding of people and personalities that allows her to put all the pieces together and find the culprit. When you’re writing you may need ways of getting information to your sleuth, so when plotting or outlining, think about how your sleuth will solve the crime and then use this information to build your cast of characters. You may have a retired police inspector as a sidekick (as I did in my Mrs Walker short stories) or you may have their husband/wife as a cop. They might be neighbours with the local pathologist! Whatever you decide to do, thinking about this at the beginning will make the writing process easier. Once I’ve got a basic idea of who gets murdered and why, I then work backwards deciding what clues should be left where, and when they should be discovered. Once I’ve got the main thread sorted out, I then add on who will be the red herrings and what clues I need to plant for that. I then convert this to a spreadsheet of plot points and map on any other story arcs such as romances, so I have a complete plan of how the crime is going to be solved. It’s time consuming, but I’ve found it worth doing to save endless re-writes and tearing your hair out trying to fix major plot holes! Holmes has Watson, Miss Marple ropes in different people in each novel, Poirot has Hastings … every good sleuth needs a sidekick and not just because it’s nice to have friends. It works as a narrative tool. It means your sleuth can bounce ideas of someone through dialogue which means your reader doesn’t have to trudge through pages and pages of internal monologue that could potentially be really boring and slow the pace. Dialogue is much more fun to read and write. Oh, and the sidekick doesn’t have to be human! Even a dog or cat can be a good narrative tool because you can break up the main characters internal thoughts! Some genres sell better as one-off books, others sell better as a series. Romance and cosy mysteries fall into the latter category. That’s not to say you can’t write them as one-off’s, of course you can, but the important thing is IF you think you might turn it into a series, you should really think about that from the outset. There are several reasons for this. Firstly, you’ll need an MC who can go the distance and stay likeable to your readers. Secondly, you’ll need to name your series something that shows the titles are linked. That way, if readers come in on the third book in a series, they’ll probably go back and read books one and two. This is why a series is good for sales, you’re basically selling several books instead of just one. And finally, you’ll need to consider how the characters will grow and change during the series. This doesn’t necessarily need to be plotted in great detail, but you do need to think about how your characters will change over time. 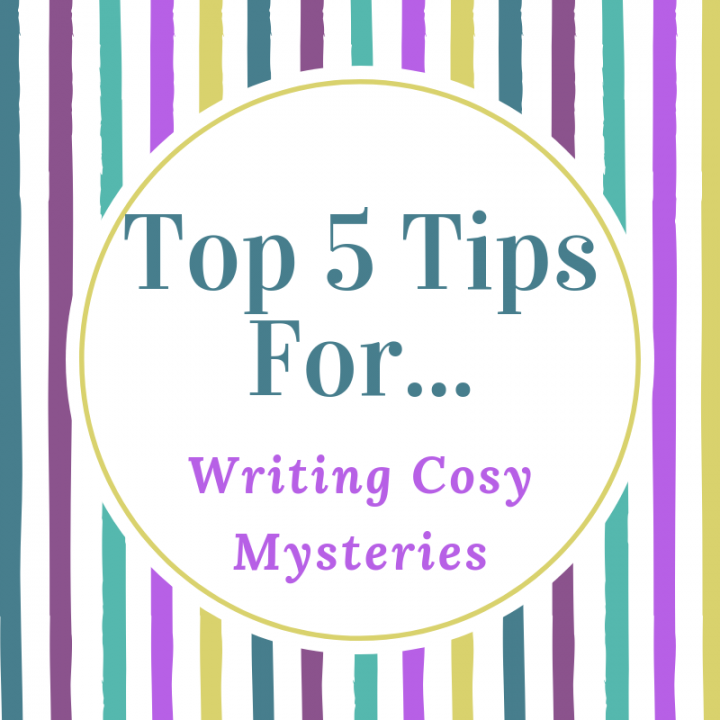 So, those were my top five tips for writing cosy mysteries, I hope you found them useful. If you enjoyed the post let me know in the comments below and feel free to share your top tips too!